NVIDIA released TITAN V back in late 2017 as a high-end compute-focused GPU, targeting AI researchers. While it wields unique tensor cores that can speed up computations essential for neural network calculations, it also features a staggering amount 5120 CUDA cores and a total memory bandwidth of 652.8 GB/s with 12 GB HBM2. 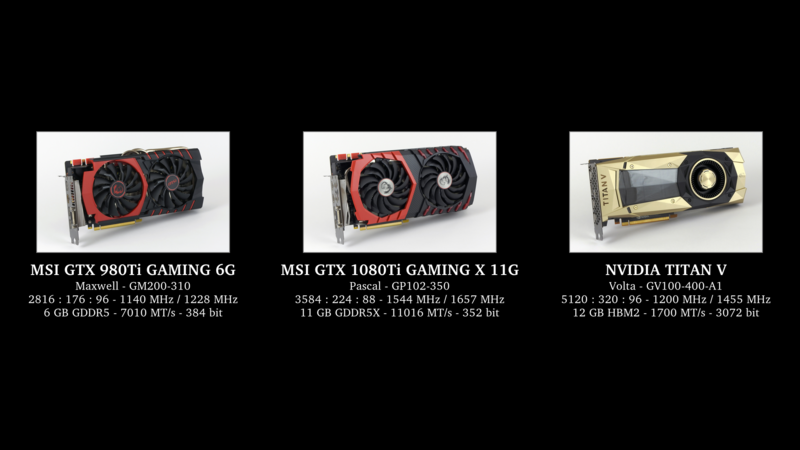 The TITAN V is put through its paces against the GTX 980 Ti and GTX 1080 Ti in a number of GPU rendering applications. Ubuntu 16.04.4 LTS and Microsoft Windows 10 results are presented as well - Window's WDDM layer can add significant overhead to computing tasks when CUDA command calls have to go through it. The card in question was used to drive the display - some applications gain performance when a card is a compute only device. All tests were executed three times (average of these runs are presented in all cases), the test was repeated in case of outlier results or anomalies. V-Ray provide a free stand-alone application to evaluate how fast your hardware renders. Redhsift offer a demo version of their fully fledged application, it is functionally identical to the commercial version, but renders with a watermark. The Cycles render engine in Blender was assessed with help of the Blender Institute-prepared benchmark pack + the recent Barbershop Interior scene from Agent 327 animated feature film. Render time is extracted so that it only covers pure path tracing time - no OpenCL kernel compilation, scene loading, CPU-side BVH construction, final composition - and Million samples per second is calculated from the resolution / resolution percentage / sample count values. Blender is launched headless (no GUI) with a python script responsible to get everything sorted and start the rendering process. Indigo and LuxMark provide neat benchmark tools with multiple scenes to test. Results are provided in Million samples per second.